Classical Greco-Roman mythology, Greek and Roman mythology or Greco-Roman mythology is both the body of and the study of myths from the ancient Greeks and Romans as they are used or transformed by cultural reception. 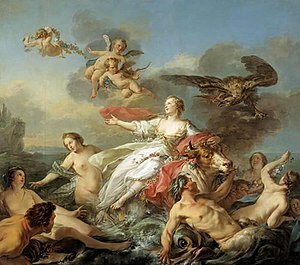 Along with philosophy and political thought, mythology represents one of the major survivals of classical antiquity throughout later Western culture. The Greek word mythos refers to the spoken word or speech, but it also denotes a tale, story or narrative. During the Middle Ages and Renaissance, when Latin remained the dominant language in Europe for international educated discourse, mythological names almost always appeared in Latinized form. With the Greek revival of the 19th century, however, Greek names began to be used more often, with both "Zeus" and "Jove" being widely used as the name of the supreme god of the classical pantheon. Classical mythology is a term often used to designate the myths belonging to the Greek and Roman traditions. The myths are believed to have been acquired first by oral tradition, entering since Homer and Hesiod (ca. 700 BC) the literate era; later works by those who studied or collected the myths, or sometimes all literary works relating to mythology, are known as mythography and those who wrote them as mythographers. A classical myth as it appears in later Western culture is usually a syncretism of various versions from both Greek and Latin sources. Greek myths were narratives related to ancient Greek religion, often concerned with the actions of gods and other supernatural beings and of heroes who transcend human bounds. Major sources for Greek myths include the Homeric epics, that is, the Iliad and the Odyssey, and the tragedies of Aeschylus, Sophocles, and Euripides. Known versions are mostly preserved in sophisticated literary works shaped by the artistry of individuals and by the conventions of genre, or in vase painting and other forms of visual art. In these forms, mythological narratives often serve purposes that are not primarily religious, such as entertainment and even comedy (The Frogs), or the exploration of social issues (Antigone). Roman myths are traditional stories pertaining to ancient Rome's legendary origins, religious institutions, and moral models, with a focus on human actors and only occasional intervention from deities but a pervasive sense of divinely ordered destiny. Roman myths have a dynamic relation to Roman historiography, as in the early books of Livy's Ab urbe condita. The most famous Roman myth may be the birth of Romulus and Remus and the founding of the city, in which fratricide can be taken as expressing the long history of political division in the Roman Republic. Syncretized versions form the classical tradition of mythography, and by the time of the influential Renaissance mythographer Natalis Comes (16th century), few if any distinctions were made between Greek and Roman myths. The myths as they appear in popular culture of the 20th and 21st centuries often have only a tangential relation to the stories as told in ancient Greek and Latin literature. ^ Entry on "mythology" in The Classical Tradition, edited by Anthony Grafton, Glenn W. Most, and Salvatore Settis (Harvard University Press, 2010), p. 614 et passim. ^ "Basic Aspects of the Greek Myths - Greek Mythology Link". www.maicar.com. Retrieved 2016-12-07. ^ Francis Haskell and Nicholas Penny, Taste and the Antique: The Lure of Classical Sculpture 1500-1900 (Yale University Press, 1981, 1998), p. xv. ^ Alexandre Grandazzi, The Foundation of Rome: Myth and History (Cornell University Press, 1997), pp. 45–46. ^ T.P. Wiseman, Remus: A Roman Myth (Cambridge University Press, 1995) passim.